Hortus Camdenensis | Ixia odorata Ker-Gawl. Cormous perennial with from 5-12 crowded, small, pale yellow or cream, sweetly fragrant flowers per stem. [CECB]. Ixia erecta var. lutea odorata, synonym I. odorata, with deep yellow flowers. ‘This variety of erecta is the most fragrant of the genus. Probably a distinct species; but as we are unable to define the difference to our satisfaction, we have thought fit to leave it as a variety of the species, to which at all events it is the closest allied. We have never known of the arrival of any considerable parcel of bulbs, from the Cape of Good Hope, which this did not accompany; so that it is probably a very common plant there. Blooms very freely in May and June; is very ornamental, and of easy culture.’. [BM t.1173/1809]. Paxton's Dictionary and Johnson's Dictionary describe Ixia erecta as having white flowers although pink and yellow forms are also listed. They are possibly including Ixia polystachya and Ixia odorata in these descriptions. They give the date of introduction to Britain of Ixia erecta as 1757. BM t.846/1805. 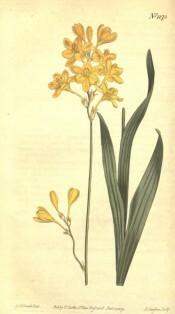 Ixia erecta is first recorded in an Addendum to the 1843 catalogue and in all subsequent editions [B.275/1843]. See also Ixia polystachya L., another possible identification for Macarthur’s Ixia erecta. More details about Ixia odorata Ker-Gawl.